In the next week ending January 14, 2006. 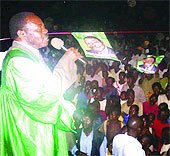 DP's campaign heads down to Western Uganda, hitting Uganda's breadbasket, before making a gateway entrance back in Masaka on January 15, 2006. DP's last 3 rallies in Mbale, Mityana (pictured left) and a short day trip to Luweero have highlighted the incumbent's endless use of rhetoric to shy away from dealing with mismanagement of the economy. Sebaana Kizito has also articulated the connection between poverty and the endless wars prosecuted by the incumbent. DP candidates have harnessed the president's visits all over the country. They are youthful and full of vigor. Susan Nabuuma is the 5th DP candidate who will fight for a straight Parliamentary seat in Kassanda. Joseph Serwanga will go head on in Mityana South represented by Nshimye Sebutulo. DP women to-date: Rainer Kafire (Kibuku), Florence Bagunywa Nkalubo (Lubaga North), Betty Nambooze (Mukono North), Sarah Kanyike Sebaggala (Makindye East), Susan Sebuuma (Kassanda South).